Don't run out of ammo on the field! 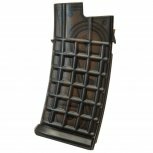 With the ASG Steyr AUG Mid-Cap Magazine 110rd you will have all the ammunition you need. Each magazine holds 110 Rounds and offers a black finish. Designed to work with the ASG Steyr AUG A3 MP AEG Airsoft Gun.